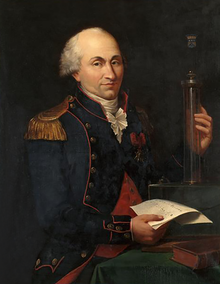 Charles-Augustin de Coulomb (/ˈkuːlɒm, -loʊm, kuːˈlɒm, -ˈloʊm/; French: [kulɔ̃]; 14 June 1736 – 23 August 1806) was a French military engineer and physicist. He is best known as the eponymous discoverer of what is now called Coulomb's law, the description of the electrostatic force of attraction and repulsion, though he also did important work on friction. The SI unit of electric charge, the coulomb, was named in his honor in 1908. Charles-Augustin de Coulomb was born in Angoulême, Angoumois county, France, to Henry Coulomb, an inspector of the royal demesne originally from Montpellier, and Catherine Bajet. He was baptised at the parish church of St. André. The family moved to Paris early in his childhood, and he studied at Collège Mazarin. His studies included philosophy, language and literature. He also received a good education in mathematics, astronomy, chemistry and botany. When his father suffered a financial setback, he was forced to leave Paris, and went to Montpellier. Coulomb submitted his first publication to the Society of Sciences in Montpellier during this time. He went back to Paris and passed the exams for the École royale du génie de Mézières in 1760. He graduated in 1761 and joined the French army as an engineer in the rank of lieutenant. Over the next twenty years, he was posted to a variety of locations where he was involved in engineering: structural, fortifications, soil mechanics, as well as other fields of engineering. His first posting was to Brest but in February 1764 he was sent to Martinique, in the West Indies, where he was put in charge of building the new Fort Bourbon and this task occupied him until June 1772. His health suffered setbacks during the three years he spent in Martinique that would affect him for the rest of his life. On his return to France, Coulomb was sent to Bouchain. However, he now began to write important works on applied mechanics and he presented his first work to the Académie des Sciences in Paris in 1773. In 1779 Coulomb was sent to Rochefort to collaborate with the Marquis de Montalembert in constructing a fort made entirely from wood near Île-d'Aix. During his period at Rochefort, Coulomb carried on his research into mechanics, in particular using the shipyards in Rochefort as laboratories for his experiments. Upon his return to France, with the rank of Captain, he was employed at La Rochelle, the Isle of Aix and Cherbourg. He discovered first an inverse relationship of the force between electric charges and the square of its distance and then the same relationship between magnetic poles. Later these relationships were named after him as Coulomb's law. In 1781, he was stationed at Paris. In 1787 with Tenon he visited the Royal Naval Hospital, Stonehouse and they were impressed by the revolutionary "pavilion" design and recommended it to the French government. On the outbreak of the Revolution in 1789, he resigned his appointment as intendant des eaux et fontaines and retired to a small estate which he possessed at Blois. He was recalled to Paris for a time in order to take part in the new determination of weights and measures, which had been decreed by the Revolutionary government. He became one of the first members of the French National Institute and was appointed inspector of public instruction in 1802. His health was already very feeble and four years later he died in Paris. Coulomb leaves a legacy as a pioneer in the field of geotechnical engineering for his contribution to retaining wall design. His name is one of the 72 names inscribed on the Eiffel Tower. ^ "Coulomb". Random House Webster's Unabridged Dictionary. ^ The "International Coulomb" was defined in modification of the International System of Electrical and Magnetic Units by the International Conference on Electrical Units and Standards (London, 1908) and adopted into the International System of Units in 1948. The name coulomb had already been used in earlier systems proposed by the British Science Association, hence the qualifier "international". ^ Coulomb (1784) "Recherches théoriques et expérimentales sur la force de torsion et sur l'élasticité des fils de metal," Histoire de l’Académie Royale des Sciences, pages 229-269. ^ Coulomb (1785a) "Premier mémoire sur l’électricité et le magnétisme," Histoire de l’Académie Royale des Sciences, pages 569-577. ^ Coulomb (1785b) "Second mémoire sur l’électricité et le magnétisme," Histoire de l’Académie Royale des Sciences, pages 578-611. ^ Coulomb (1785c) "Troisième mémoire sur l’électricité et le magnétisme," Histoire de l’Académie Royale des Sciences, pages 612-638. ^ Coulomb (1786) "Quatrième mémoire sur l’électricité," Histoire de l’Académie Royale des Sciences, pages 67-77. ^ Coulomb (1787) "Cinquième mémoire sur l’électricité," Histoire de l’Académie Royale des Sciences, pages 421-467. ^ Coulomb (1788) "Sixième mémoire sur l’électricité," Histoire de l’Académie Royale des Sciences, pages 617-705. ^ Coulomb (1789) "Septième mémoire sur l’électricité et le magnétisme," Histoire de l’Académie Royale des Sciences, pages 455-505. This article incorporates text from a publication now in the public domain: Chisholm, Hugh, ed. (1911). "Coulomb, Charles Augustin" . Encyclopædia Britannica. 7 (11th ed.). Cambridge University Press. Wikimedia Commons has media related to Charles-Augustin de Coulomb. French National Library The Mémoires of Coulomb available in pdf format. O'Connor, John J.; Robertson, Edmund F., "Charles-Augustin de Coulomb", MacTutor History of Mathematics archive, University of St Andrews .